A consultancy dedicated to delivering customer management solutions that bring results. 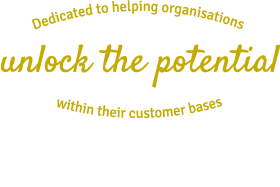 We help organisations large and small, both Business and Consumer focused to put themselves in their customers’ shoes and set out and deliver a clear path to customer success. We are brave enough to work with you on trying out new things, and getting things moving quickly. We believe in the teams we work with to deliver special things for their customers. 80% of our business coming from referrals. Our clients approach us because of our strong track record and reputation for excellence. What keeps them coming back is our caring and generous approach to consultancy, our passion and our knowledge. It is our mission to make a real difference to the companies and people we interact with. We inject knowledge, ideas, and process into a project, pepper with training and support and make a big difference, fast. A team that makes your Customer Essential! We help organisations large and small, both Business and Consumer focused to put themselves in their customers’ shoes and set out and deliver a clear path to customer success. We enjoy a customer challenge and love to see our customers succeed.